A large raccoon sits atop a tree stump inside of which the other small raccoons sit. There are also a frog and a fish. Water shoots out of the top of the log, the fish, and the frog. 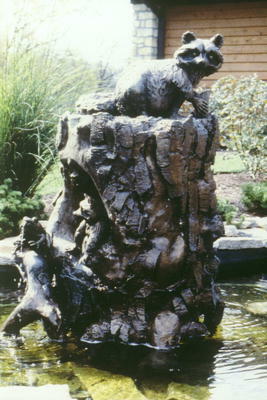 : Voss Finn, “Raccoon Fountain,” Ohio Outdoor Sculpture Inventory, accessed April 22, 2019, http://oosi.sculpturecenter.org/items/show/487.